Since the re-launch of Guardians of the Galaxy there has been one question on everyone’s mind: what happened to Richard Ryder a.k.a. Nova? I know I’m not the only one wondering about this because I’m certain someone else mentioned it to me before I understood what it meant. 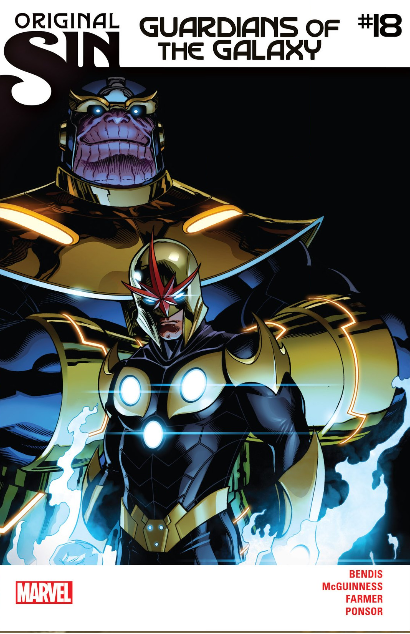 With Guardians of the Galaxy #18, readers are beginning to find out. I say begin, because unfortunately, there is not actually a conclusion to the story this issue, which sums up my biggest complaint about the book. 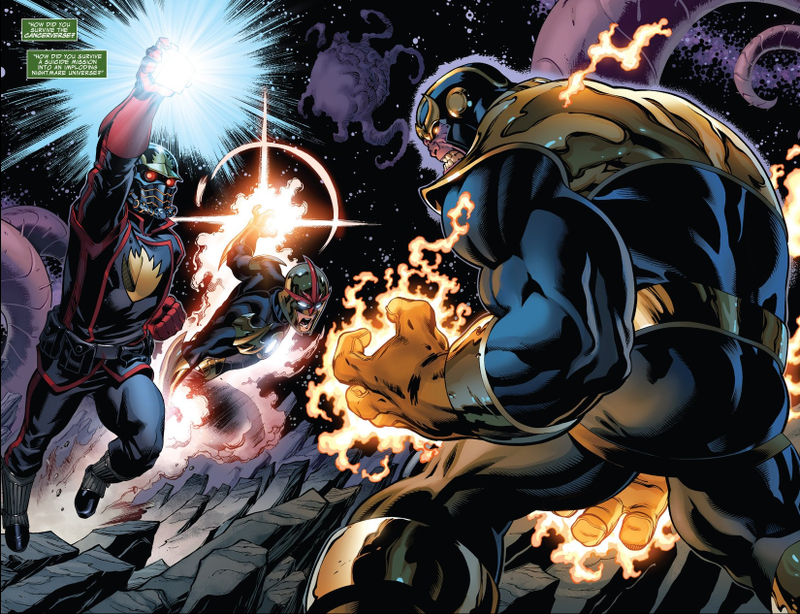 There were several great looking double page spreads of Nova and Star-Lord fighting Thanos, but I’m not certain that they were all necessary. The story could have moved along a bit more quickly, and maybe even wrapped up in one issue. To be fair, there may be more to the story than I’m anticipating at this point and I may re-evaluate after the story does wrap up. I have to say this was otherwise a nice issue of Guardians that spent most of its time at the end of the Abnett/Lanning run and the Thanos Imperative, which is nice. Since Abnett and Lanning aren’t writing this issue, I’m gladder than ever that Brian Michael Bendis is writing this series. He does justice to the characters as they stood at the time the events are taking place, instead of just doing whatever he pleases, as other writers might do. I would like to know more about how Star-Lord got himself into his current predicament, but I have faith that we’ll get some of that information in issues to come. Ed McGuinness is no slouch when it comes to art and I’m glad that he is doing the interiors. I’m hoping that McGuinness will be able to stay on the book for a while, because I thoroughly enjoyed the art on this issue. Over the run of the book there have been several artists, most not sticking around past a single story arc. While this isn’t necessarily a problem, I would like a more consistent look to the book, and I wasn’t overly thrilled with the previous art team. The interiors remind me more of the earlier issues of both this volume as well as the previous. As I mentioned before the double page spreads of Nova and Star-Lord were great, and McGuinness made a real effort to make the characters look like they did during the events of the Thanos Imperative.